Kathy Munch is the 1st place winner of the 11th Annual 'Guess the Weight of our Giant Pumpkin' contest. 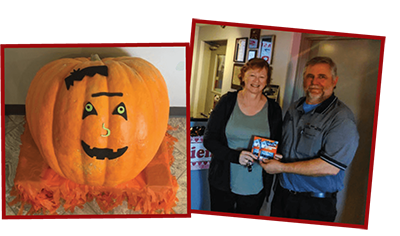 Kathy walked away with a $50 Movie Theater Gift Card for guessing the weight of our 147 pound mammoth pumpkin! Congrats Kathy! View our December Newsletter!